Birds are recognized as indicators of ecological change. Knowledge about the mountain’s mammalian residents varies, but is generally limited. 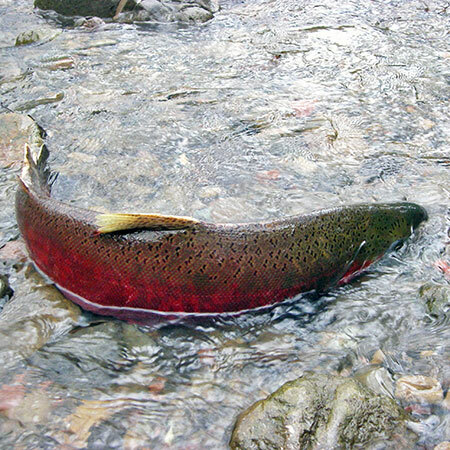 Anadromous fish are an important food source for many species. 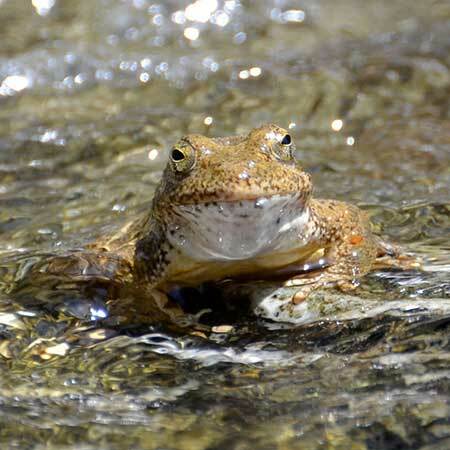 Amphibians and some reptiles are similarly responsive to aquatic habitat conditions. The wildlife indicators chosen for this report were, in part, selected based on the amount of information available. 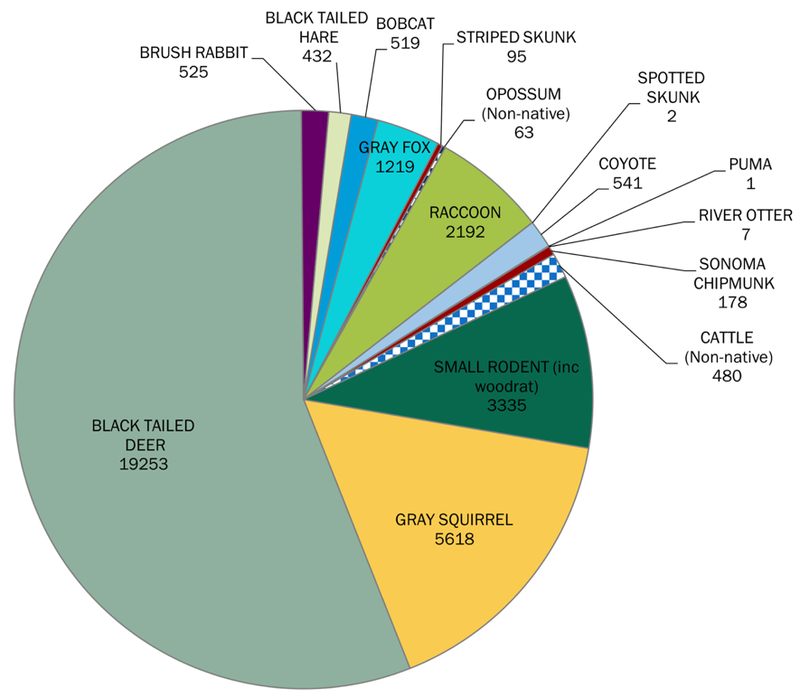 Data on the mountain’s wildlife vary widely depending on whether they have ever been inventoried, or if they are regularly monitored. Some species, such as the threatened Northern Spotted Owl (Strix occidentalis caurina), have been monitored for years, whereas mammal monitoring is just now underway. Other groups, like invertebrates, have never been systematically inventoried or monitored on Mt. Tam. Some wildlife indicators were chosen if their condition and/or trend might reveal something about other aspects of ecosystem health, even if existing information on their condition or trend was limited. For example, American badgers (Taxidea taxus) are good indicators of grassland ecosystem extent and quality, and North American river otters (Lontra canadensis) can reveal a number of things about both riparian and terrestrial habitats, although current data on these species on Mt. Tam are limited. How Were Wildlife Indicators Chosen? The wildlife indicators included here were chosen, in part, based on the amount of information available on them. The amount of data available on Mt. Tam’s wildlife vary widely depending on whether they have ever been inventoried or if they are regularly monitored. 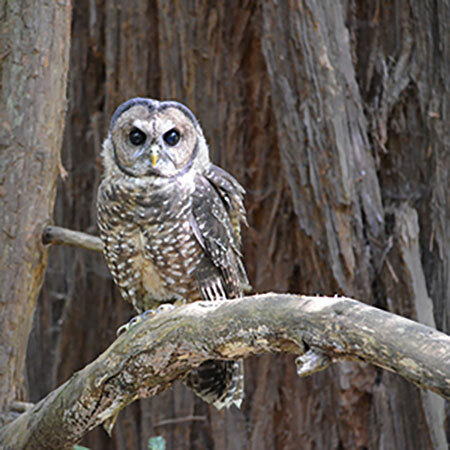 Some species, like the threatened Northern Spotted Owl (Strix occidentalis caurina), have been monitored for years, whereas mammal monitoring is just now underway. Other groups, like invertebrates, have never been systematically inventoried or monitored on the mountain. You can learn more about some of these important data gaps here. Indicators were also chosen if their condition and/or trend might reveal something about other aspects of ecosystem health, even if existing information was limited. 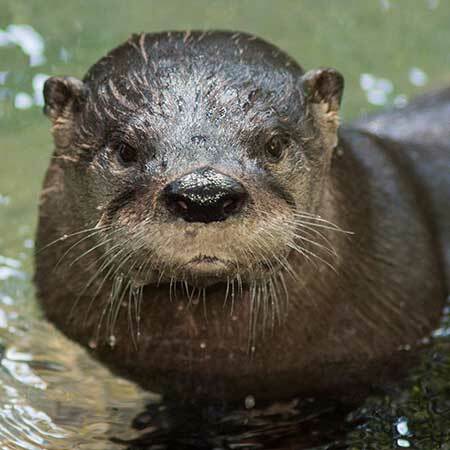 For example, American badgers (Taxidea taxus) are good indicators of grassland ecosystem extent and quality, and North American river otters (Lontra canadensis) can reveal a number of things about both riparian and terrestrial habitats. The links in the photos above will take you through the different wildlife indicators used in this health assessment from their broadest categories down to the individual species level. Additional information about this health assessment process, including how indicators were chosen, is available in the What We Did section of this site. The links below provide additional information about Mt. Tam's wildlife. There are many ways that wildlife can be used to help measure the health of Mt. Tam. Entire guilds or groups of wildlife can reveal things about the condition of their habitats. Individual species can prove to be good indicators of certain aspects of ecosystem health. Considering the mountain’s health by combining—or “rolling up”—the individual health indicators described above allows us to begin to explore how well ecological systems and landscape-level processes are functioning across the mountain as a whole.